Guide your expedition through hazardous terrain and hostile territory as you compete to find the most treasure. A nicely produced ‘gateway’ game with a big emphasis on bidding, fun cartoony graphics and relatively simple gameplay from Bruno Faidutti and his buddies. Faidutti considers this game his best design, and I think it’s a very clever and very interactive game that is perfect for families, in the vein of Ticket to Ride—in fact it very much feels like a Days of Wonder game rather than a Fantasy Flight Games one. 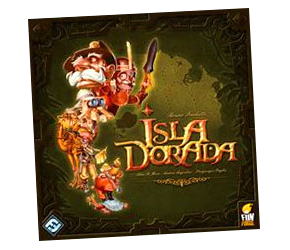 The main mechanic of Isla Dorada is bidding. 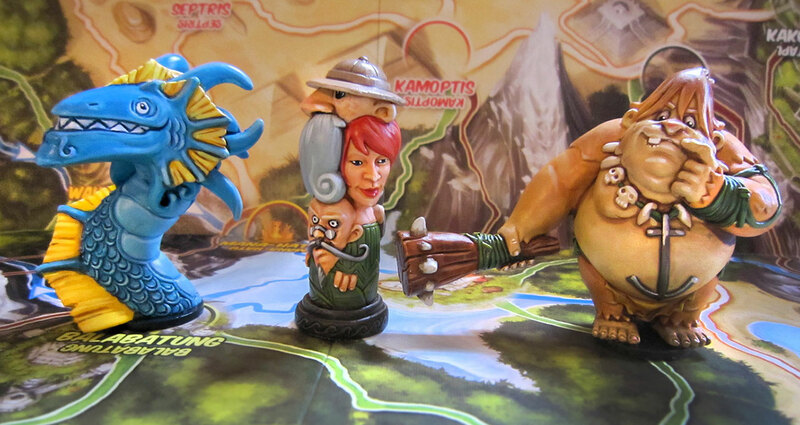 You have a single expedition figure on the island map, and each turn players bid a number of cards to control the expedition for that turn and move it where they want to go. Different cards are used to bid for different types of paths—mountain, jungle, desert, river, and sea paths, and even air travel by giant bird or zeppelin. Of course there’s also a plethora of special cards that can do things like stop another player from bidding, convert cards to different types, and keep the expedition moving past the next location on the route. At first it all seems a bit daunting as all these cards have different semi-imaginary names in keeping with the ‘lost pacific island’ theme; but an excellent pictorial reference sheet helps you pick it up very quickly and before long you’re remembering which card is which with ease. You want to control the expedition’s destination because at the start of the game, and at two points during it, you receive Treasure cards keyed to various locations. You also get a Destiny card, which gives you points for visiting a particular series of locations, and you can get Curse cards, which can reduce your points if you go to those places. So each player has very definite ideas indeed about where the expedition should go on the island! It’s a chaotic and crazy game with a little bit of what gamers call ‘screwage’ (ie, you have opportunities for making things tough for other players), all wrapped up in colourful and light-hearted artwork. There’s even three beautiful large miniatures incuded; one for the expedition and two for the Bigfoot and Leviathan, which can be played to block map routes.